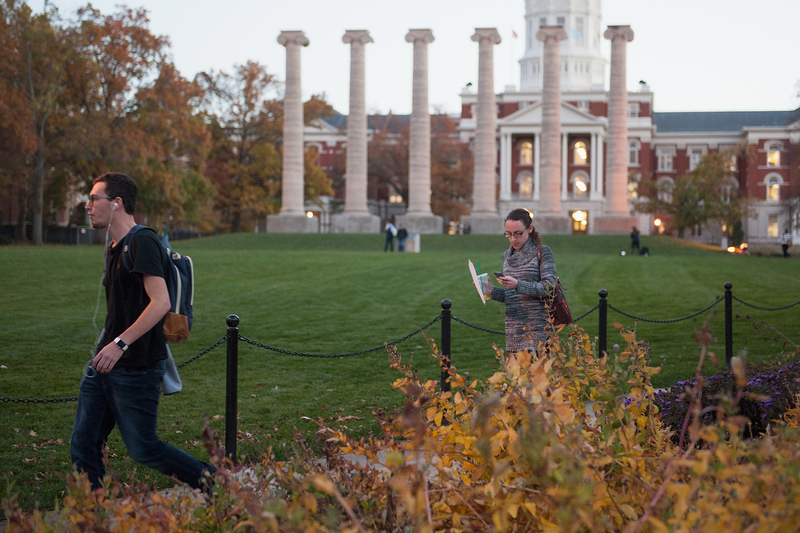 Some Missouri protesters are unhappy with how the events at the University of Missouri have been covered, and one altercation between a student journalist and university staff has drawn even more attention to the school. A university professor and an administrative staff member were caught on video forcibly trying to prevent a student photographer from covering the student protesters. Janna Basler, an assistant director of student life at the school, was one of these two caught on video. A Missouri state senator called for Basler's ouster on Wednesday and she was put on leave as the school investigates her actions. She was relieved of her duties that included overseeing the Columbia campus's Greek Life. Video of Basler shows her chiding and having physical contact with the student journalist, who has been identified as Tim Tai. During the protest — following the resignation of university systems President Tim Wolfe — Basler formed part of a wall, mostly made up of students, to keep reporters out of the protest. The YouTube video of the incident has been seen more than two million times. About two minutes in, Basler tells Tai to "back off," seemingly shoves him and then puts her hand in front of his face. Tai tries to unsuccessfully make the case of his first amendment rights to take pictures in public, but the protesters and Basler won't have it. On Tuesday the university Office of Greek Life released a statement from Basler. She apologized for her actions at the protest, saying she was "deeply sorry" and said it had been a learning experience. "As a student affairs professional, I take my responsibility to students very seriously. Yesterday, I allowed my emotions to get the best of me while trying to protect some of our students. Instead of defusing an already tense situation, I contributed to its escalation. I regret how I handled the situation, and I am offering a public apology to the journalist involved," Basler said in the statement. The school's Greek councils issued a statement in support of Basler. They said they were disappointed by the video but they hope that the university takes her success in her position when disciplinary actions are considered. They said her support for students has been unwavering since she started at the university in 2001. The leaders of these Greek councils attribute much of their success in sexual violence education, diversity training, leader development and unity between the councils to Janna’s leadership. She has aided, advocated for and defended marginalized students, particularly in Greek Life, ceaselessly on our campus. Her advocacy and support for her students has been unwavering for more than a decade. The student journalist was trying to take pictures of the group Concerned Student 1950, the student activist group that organized against the racial hostility that had been allowed to persist on the University of Missouri campus. The name of the group comes from the first year that black students were allowed into the school. Following protests that included a threatened walkout by campus staff, a football team on strike, and a graduate student on a hunger strike, President Wolfe resigned. He was joined by the chancellor R. Bowen Loftin, who will move to a research position with the university.